Blessed is [s]he who never expects anything, for [s]he shall never be disappointed. Heady words indeed. Words, in fact, I have mistakenly attributed for many years to being the ninth beatitude. And today I find that they’re not. They were written, apparently, by Alexander Pope, sometime back in the eighteenth century. Now, you’d think that it wouldn’t much matter who wrote them or why, not if you use them as I do on a regular basis to better manage my expectations. But this error of mine sent me on a search for the eight original beatitudes, a list to which I’ve been unwittingly tacking on a ninth. ….those who hunger and thirst for righteousness: for they will be filled. ….the merciful: for they will be shown mercy. So, it dawned on me that the term beatitude has to do with blessing. [I’ve never claimed to be the smartest kid in the class.] And I can see why I might have thought that Pope’s line on expectation could have fit so nicely. Albert Camus reckoned: Blessed are the hearts that can bend; they shall never be broken. Friedrich Nietzsche had this to say: Blessed are the forgetful, for they get the better even of their blunders. But my vote goes to Groucho Marx: Blessed are the cracked, for they shall let in the light. But back to expectations and not being disappointed. A few years ago, I came across author C.J. Sansom. I was in Malta and in need of something to read. I’m a sucker for 3-for-2 deals and a good thick book. So I bought the first three in his Shardlake series, historical crime set in Tudor times. Unputtable downable. All of them. I eagerly awaited books 4 and 5, having fallen completely in love with Matthew Shardlake while at the same time learning about Tudor history, something I’d obviously slept through in History class. Sansom is first and foremost a historian. He’s doubly blessed in that he’s also an excellent writer. And if you’re a fan of crime novels, you get the mystery and the education at the same time. 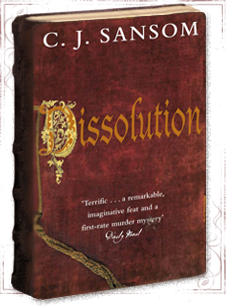 He left Shardlake to his own devices for a time, writing Dominion – set in a fictional 1952 where twelve years have passed since Churchill lost to the appeasers, and Britain surrendered to Nazi Germany after Dunkirk. It was so real, I had to constantly remind myself that it wasn’t true. I’ve just finished Winter in Madrid and am reeling at the atrocities committed during and after the Spanish Civil War. I’d been completely clueless. What did we study in History class? I thought I’d read them all but see that his latest Shardlake – Lamentation – published in October last year so it’s now officially topping my list of what to read next. The man’s a genius. I’ve come to expect great things from him and, not one to disappoint, he always delivers. Blessed am I indeed to have found him – and grateful, too, that there are writers out there who can both entertain and educate at the same time. You started me on C.J. Sansom a couple of years ago Mary and I to have been reading away and enjoying the adventure through history. I must admit I have purchased Lamentation but I am finding it hard to read it before I go to sleep as it makes my heart beat a little too fast. It is good reading, maybe it is the age. Mr C.J.Sansom is now on my list of “must read”, thank you.